← Start As You Mean To Go On. One of the constants in our fairly grim days is a local coffee shop that still stands firm. The first thing you must do when a big aftershock hits is to save your drink – especially if it’s a nice wine or a good coffee. THEN you decide whether or not you need to get under the table. It’s kinda funny to watch a cafe full of people reading the morning papers or the latest gossip mags casually reach for their cup and lift it off the table without even taking their eyes off the page. The walls wobble and the roof shakes but no one bats an eyelid… until the drink starts to slosh. Our local coffee shop also has tried and tested wide solid tables that the whole family can fit under. You understand what an important cafe attribute this is in 2012 Christchurch. 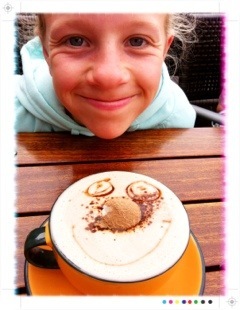 More importantly though is the fact that, even though you’re 14 and a serious scholar and a top sportswoman, the local coffee shop will still make you a smiley face hot chocolate with a marshmallow nose. Mainly because you dish out hugs to anyone cool enough to know that you still love it this way. Happy New Year Miss Flossy – I meant to write that on your last post – I am really fascinated by the experiences you are having in Christchurch and am interested to read about them. When our neighbour installed a basketball hoop over their soakage pit one metre from our boundary I nearly went insane from the vibrations flooding our house – it really made me appreciate even a fraction of what it must be like to be living with vibrations all the time. (or intermittently, where you start to dread and anticipate the next set of vibrations, which could be even worse). The new normal, I guess. Think of you every time there’s a quake reported, and other times, as well. You’re a great chronicler.